Are you now singing the U2 song which is the title of this book? Yes, me too! 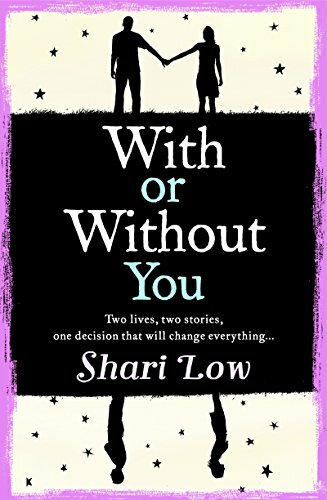 I’m delighted to be kicking off the blog tour today for With or Without You, the new novel from Shari Low which is published today. The story begins on the stroke of midnight as 1999 turns into the year 2000. Liv is making the big decision whether to stay with her husband Nate or not, after they have spent a year trying to make their marriage of seven years work for them. There’s nothing bad happened, it’s just that life isn’t exciting anymore, rather routine and Liv feels that a lifetime partnership should be more than that. The first part of the book looks at what happens if she leaves him and the second if she stays with him. Looking at what might happen if a different path had been chosen in life is a popular theme in film and literature: think Sliding Doors, The Versions of Us and It’s a Wonderful Life. I think we all wonder ‘what if?’ on occasion, whether it’s a big life-changing decision like Liv made or any of the small decisions we make each day. Through both sides of the story, we see the consequences, the ripple effect of Liv’s decisions. Good things that happen in one version of the story, don’t in the other and vice versa. Every decision we make has so many consequences and no-one can predict what they will be. It’s a bit like how in It’s A Wonderful Life, lots of men on a ship in WW2 died since Harry Bailey wasn’t there to save them, because George Bailey hadn’t been there to save Harry from drowning when he was a boy. One thing about Shari Low’s writing is that she has a real talent for making me feel fully engaged with her characters. They feel real and they are people I really care about. I really wanted them all to find their happy endings. The characters seemed like a great group of people and there was a lot of laughter in their lives. Liv’s mum, Ida, was a hoot! Liv and Nate were part of a very strong friendship group who stuck together in both versions of the story and were a great support to each other no matter what. Justin in particular was someone who needed lots of support and his friends really stuck by him. Having experienced trying to support someone with the same problem as him, I know just how hard that can be. We can never know what the right decision is but can only make the right decision for ourselves at that precise time. We also can never know what would have happened if we had chosen differently, we can only speculate, which is probably just as well! As for what the right decision was for Liv and Nate, well I’ll leave you to find that out for yourself. What I will say is that as far as I was concerned, everyone ends up in the right place, with the right people, at the right time. With Or Without You is a thought-provoking and very enjoyable read.